ObamaCare guarantees issuance for all regardless of preexisting conditions and therefore will impose a penalty for those that do not have insurance for the “metal” plans: Bronze Plan, Silver Plan, Gold Plan, and Platinum Plan. With the Affordable Care Act, penalties are determined by the amount of months that a person is without health insurance. For instance, if you didn’t have health insurance for 6 months a prorated amount will be tacked on when you do your taxes (you pay 50%). There are small windows of time that you go without insurance that will not effect you. Click here to learn about ObamaCare: Temporary Exemptions for the Uninsured. 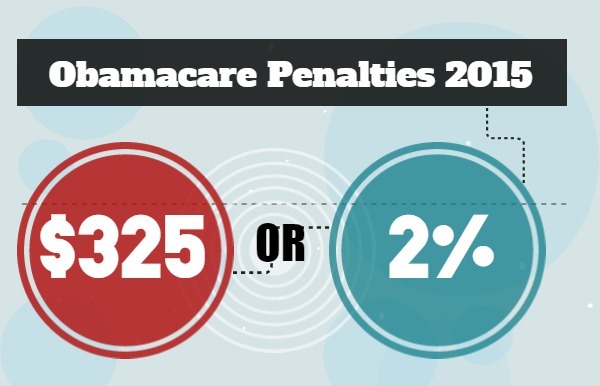 What are the Federal Penalties for Being Uninsured? $325 or 2% of your income in 2015, whichever is higher. There is also an uninsured child penalty of $162.50 per child, maxing out at $975 per family. To learn what your specific monthly premium under the Affordable Care Act would be call 800.930.7956. Are there Federal Exemptions from Penalties? For any further questions about Obamacare penalties call 800.930.7956 or contact Medicoverage. according to the supreme court their are no penalties. You pay a tax to the irs for failure to have insurance. It would have been unconstitutional for congress to pass penalties. They only have taxing authority. Need to change the format reflecting Obamacare Tax for uninsured.